Welcome to Benetis in RTP! Start your day at Benetis with the best breakfast in the Triangle, come visit us at for a taste of the Mediterranean at lunch! We are conveniently located near RTP at the Greenwood Commons Shopping Center. 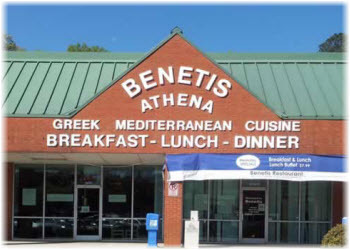 Benetis offers authentic Greek cuisine in addition to traditional American meals, serving lovingly crafted traditional dishes, from moussaka to gyros. Whenever you visit, you'll be bowled over by our super-friendly staff and attention to detail — we want to make your dining experience a treat. Come see us soon! Every morning, we select the finest ingredients for the perfect breakfast to start your day! Choices range from skillets to waffles to eggs benedict, and more. Come early on weekdays for a breakfast special — just $5.99 between 9 am and 11 am (not valid on holidays or with other discounts or coupons). On weekdays, we offer the best Greek/Mediterranean lunch buffet in Durham! We also have a full range of options on our menu, including Greek classics such as gyros as well as burgers, sandwiches, and more.